Nars Radiant Creamy Concealer in // Real Techniques Brush // Bobbi Brown Creamy Concealer Kit in Porcelain // Nars Smudge Proof Eyeshadow Base // Urban Decay Eyeshadow // Real Techniques Brush // Brush // Urban Decay 24/7 Eyeline // Clinique Bottom Lash Mascara // Tarte Lights Camera, Lashes Mascara // Dior Creme De Rose Lip Balm // Jour Lipgloss in Tender. Over the past couple of months I’ve come to the realisation that I really do not need a million and one beauty products. There is no need to have six body moisturisers or cleansers open at the same time nor do I need a whole filing cabinet full of nail polish when I’ve pretty much spent the past year nail polish free. 2015 is the year I’d like to reduce my stash to only the essentials and I will only have one product open per category at a time. Sure, I’ll probably have back up products for when I’m nearing the end of a product but there is no need to have four. This is where the beauty bag comes into it. It’s a sort of shopping the stash type thing but also making sure I rotate the products I’m using so nothing is left sitting there for a year untouched. I’m terrible at using the same products over and over again and getting stuck in a rub especially when it comes to make-up. At the start of each month I’m going to gather a selection of products that I’d like to get more use out of and share them with you. I’m hoping by doing this I’ll also be able to separate the good from the bad and minimise everything. This months is a bit different to most as for the majority of January I’ve pretty much been living out of suite case as I’ve been house sitting for a family friend and looking after their cat. I obviously couldn’t take everything with me so I added things I thought I’d need on a daily basis which isn’t a lot. 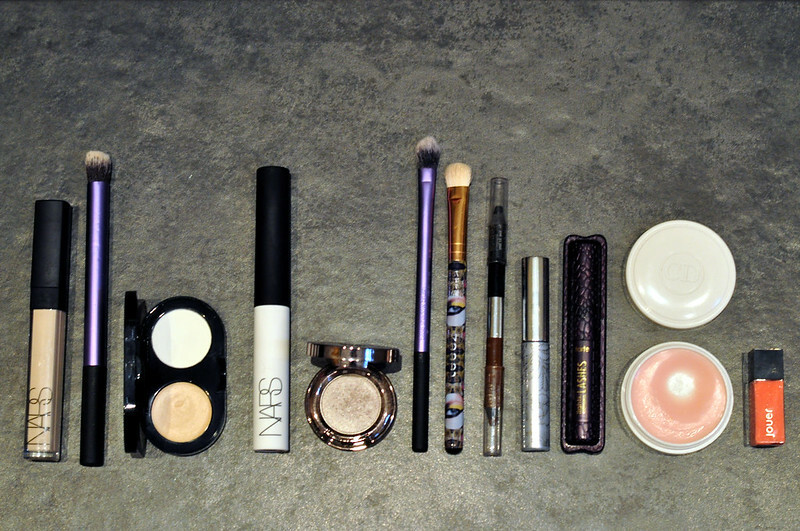 For work I only tend to use mascara and then I just added some eye products for the weekend. As usual there is always something I forget when I pack and this time it was lip products. Luckily I had this tiny tube of lipgloss from Jour in my work handbag which I actually really like as well as a lip balm that I packed as part of my skin care routine. Other than that though it’s all pretty minimal.